>Sonography (Ultrasound-US) is considered as a first-line imaging modality for the evaluation of female pelvis. It has a significant role in the management of patients with vaginal bleeding, especially in postmenopausal population and for detection of endometrial cancer. Also, it is useful in identifying and characterizing ovarian lesions in up to 75% of the cases. However, sonography exhibits considerable limitations in evaluating uterine cervix or localizing quite large pelvic masses; furthermore, its role in staging and follow up of gynecologic malignancies is still restricted. 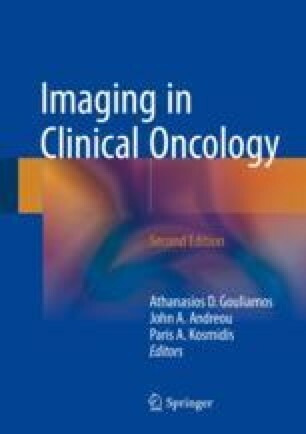 The development of more sophisticated techniques, like contrast-enhanced or three dimensional US, may improve diagnostic efficacy in the future.The aim of this chapter is to describe common sonographic features of uterine and ovarian malignancies and to review the diagnostic efficacy of sonography in such cases. Ultrasonography (US) is considered as the initial imaging method for the evaluation of the female pelvis. It is a noninvasive, easily repeatable, cheap, and widely available imaging modality, which provides a quick overview of the female reproductive system. Since it lacks ionization, it is a safe method for the evaluation of young females and pregnant patients (Fielding et al. Gynecologic imaging. Expert radiology series. Elsevier Saunders, Philadelphia, PA, 2011; Fischerova, Ultrasound Obstet Gynecol 38:246–266, 2011). Bimanual clinical examination has low sensitivity in recognizing uterine and ovarian tumors (Padilla et al., Obstet Gynecol 96:593–598, 2000). On the contrary, US can easily detect and characterize pelvic masses of uterine or adnexal origin, predicting also their benign or malignant nature. US may be susceptible to pitfalls since it is dependent on the operator’s experience, equipment, and patient’s body mass index. During the last decades, there was a significant improvement in technical quality parameters; therefore, US can be used as a reliable tool for the depiction and classification of most gynecological tumors, for follow-up examination, and even for the detection of recurrence in oncologic patients, especially when carried out by a sonographer dedicated in gynecologic oncology (Fischerova, Ultrasound Obstet Gynecol 38:246–266, 2011). The aim of this chapter is to describe typical sonographic features of common uterine and ovarian malignancies in pre- and postmenopausal population and to review the diagnostic efficacy of sonography in such cases.